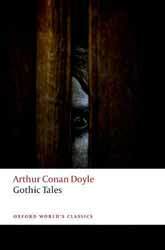 Oxford University Press presents the Oxford World’s Classics Gothic Tales, by Arthur Conan Doyle – 34 stories (across 499 pages) set in the order in which they were written, in a listed timeline between his birth in 1859 and his death in 1930. There are ghosts, madmen, people with a powerful influence, evil surgeons, immortals and devil-worshippers. Conan Doyle is undoubtedly best known for his creation of the world’s greatest detective, Sherlock Holmes. However, he is also lauded as one of the most original and articulate writers of classic tales of terror, the occult and spiritualism, using his experiences of wide travel and professional work in the medical field. As well as the aforementioned timeline which includes other significant events, there is also an Introduction. This should really be an Afterward, because it reveals snippets of information about plotlines and characters. There is also a select bibliography. The book is edited by Darryl Jones. The Explanatory Notes is the most annoying thing about this collection. I realise there is a pedantic attempt to detail every meaning in the book, but frequently seeing an asterisk in the text soon begins to grate. If you don’t understand a phrase or location look it up; that’s what the Internet is for! Let’s get to the stories themselves. I’m a big fan of Sir Arthur Conan Doyle on the written page. I have the complete Sherlock Holmes collection in hardback and return to it periodically. I’ve come across a number of his Gothic tales before in other collections of period ghost stories or supernatural Egyptian monologues. The Ring of Thoth, and Lot No. 249 make regular appearances, but many of the others are lesser known – even though they’ve materialised as radio stories and audio books. I love this somewhat formal narrative style of writing from the late 1800s and early 1900s, which may explain why I positively covet my leather bound copies of H.P. Lovecraft, Edgar Allan Poe, M.R. James, Bram Stoker and others. I find it exhilarating and absorbing, the Victorian period being so appealing in style and invention. Of course, this won’t be the opinion of many young contemporary reader. They might describe events as agonisingly slow; certainly, there are no modern day whizzes and bangs. Recollections of a personal or relayed experience, sometimes without any conclusive outcome may leave some wanting. However, I think these draw you in slowly, seeping into your consciousness so that – without being outwardly frightened – you are carried along by the mystery, intrigue and outlandish characters. I’ve read and thoroughly enjoyed the first eight of these stories, and fully intend to continue reading the remainder. It’s very sad that no one writes like this anymore. Material such as this should be much cherished. The only way this paperback could be improved is by presenting it in a leather bound hardback format.